Multi Emmy-Award winning filmmaker Shane Stanley, a lifelong entertainment industry insider, has worked in every aspect of the film industry, covering a multitude of movies, television shows, and other projects. 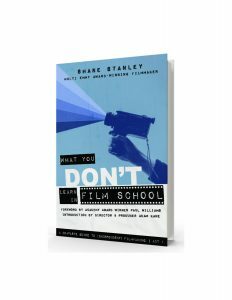 In his valuable new book, WHAT YOU DON’T LEARN IN FILM SCHOOL: A COMPLETE GUIDE TO INDEPENDENT FILMMAKING, Stanley takes a candid look at the film business and offers ambitious young filmmakers important information on how to navigate every aspect of making movies, from initial pitch to distributing a finished product. The book “is written for anyone who hopes to have a career in the industry at any position, but (is) geared for (the) total filmmaker,” Stanley says. Multi-Emmy Award winning filmmaker Shane Stanley has worked in almost every capacity on and off the set starting with hit shows like “Entertainment Tonight” and “Seinfeld.” Along with his father, Stanley produced “The Desperate Passage Series,” which was nominated for 33 individual Emmy Awards and won 13 statues. In this series, five of the seven specials went No.1 in Nielson Ratings, which included “A Time for Life” and “Gridiron Gang.” Stanley has produced films starring Marlon Brando, Mira Sorvino, Thomas Hayden Church, Donald Sutherland, Marisa Tomei and Martin Sheen. He co-wrote two of the films and has worked closely with top Hollywood executives. Stanley has taught workshops at many film schools and universities. He is the founder of Visual Arts Entertainment, a production company based in Los Angeles. He is still active in teaching, working with several schools, film students, and recent grads as a mentor and guide.